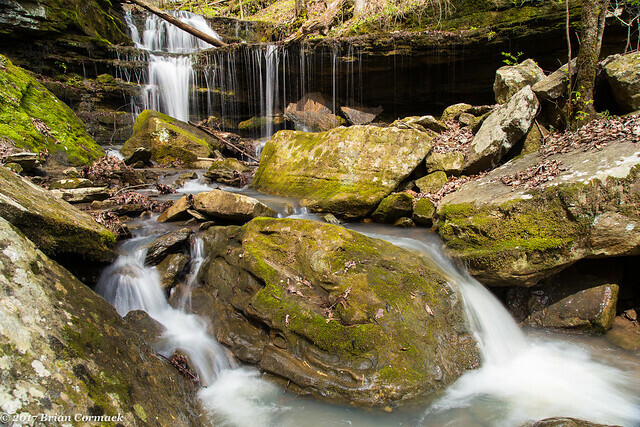 From Pack Rat Falls, I made the short walk over and made a visit to Haw Creek Falls. 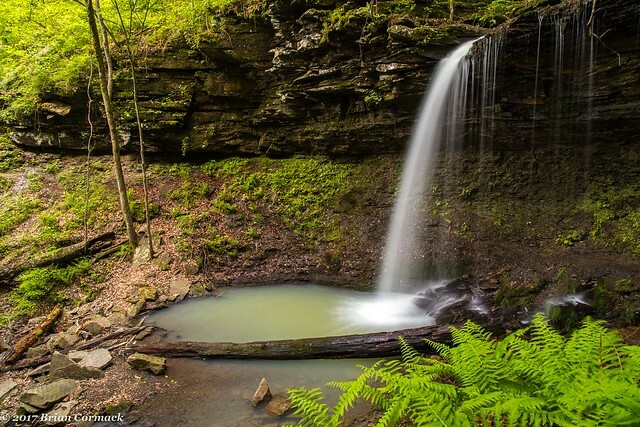 Haw Creek Falls is only six feet tall, but it is an impressive waterfall. 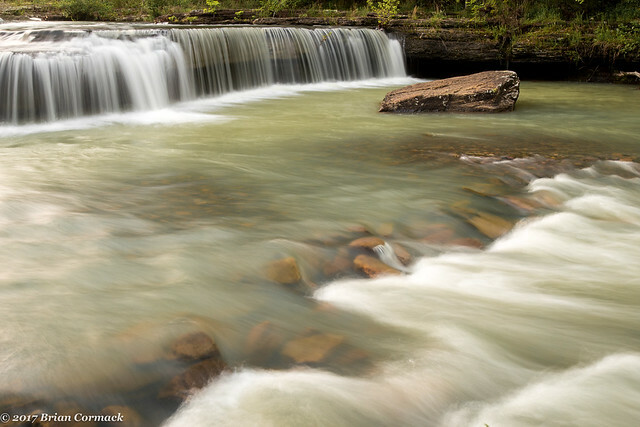 The falls stretch across the entire creek, tumbling off a rock shelf that sticks out above the creek. 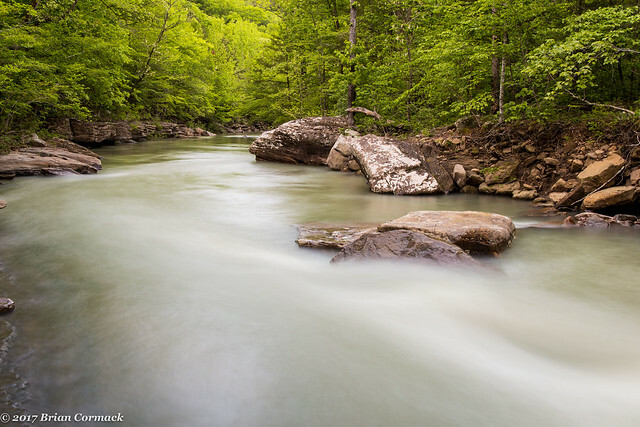 Just down the road is a small camping spot right along the creek, which provides a great spot to access a different spot along Haw Creek. The creek was definitely running high after all the recent rains. It was getting dark, and there wasn't much light left out there to take pictures. 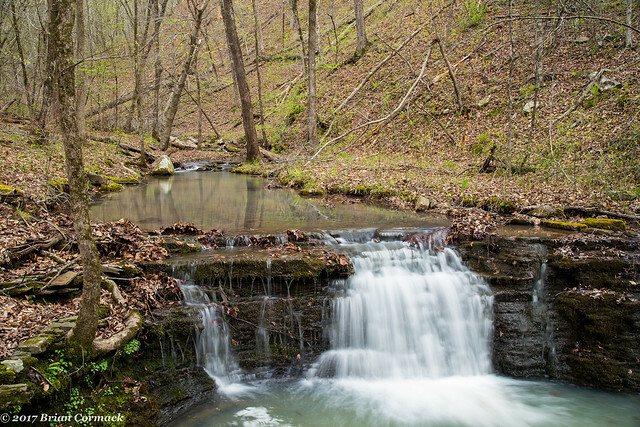 I got one last shot of this small creek that poured into Haw Creek with a small waterfall. We got a ton of rain a few days ago, enough to really get all the waterfalls up and running. 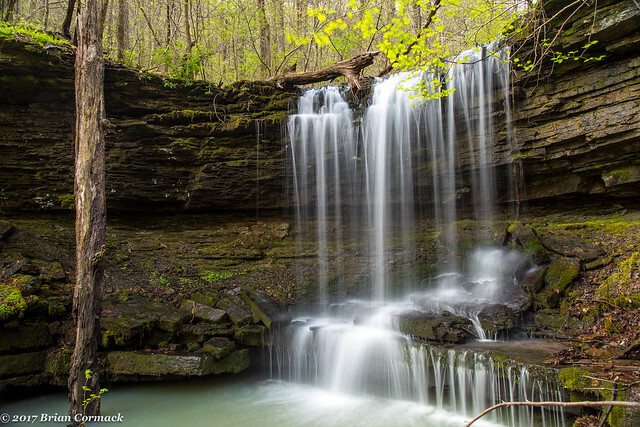 I was able to get away for a few hours on Sunday afternoon, and decided to drive up to the Ozarks and do the hike to Pack Rat Falls. The waterfall is a scenic spot, but one that I haven't been to in eight years. I've been wanting to make a return visit, and the conditions were perfect over the weekend. 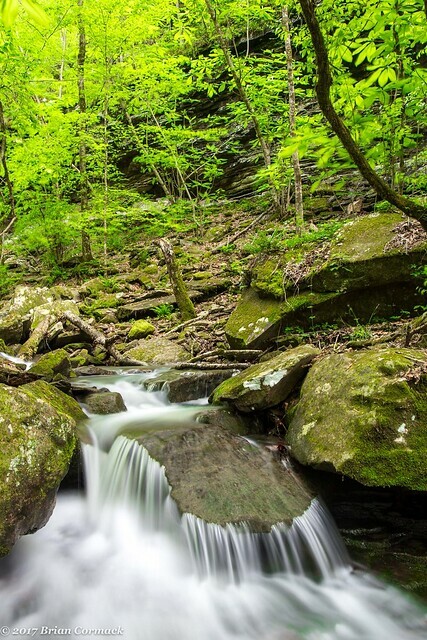 The trail to Pack Rat Falls starts out at the back of the Haw Creek Falls campground. 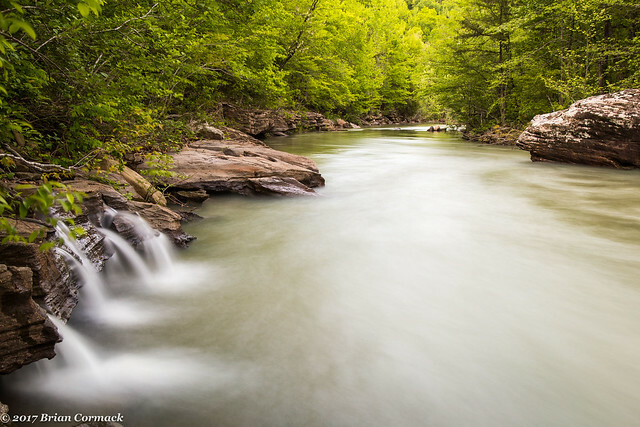 From there, you just follow a small creek for about a half mile. 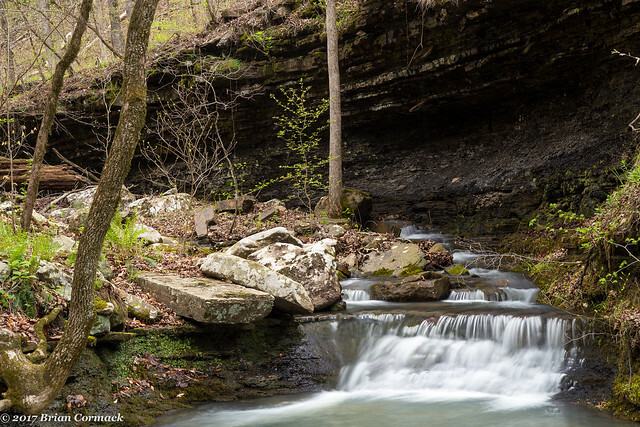 The creek itself is very scenic, with lots of moss-covered rocks and several small waterfalls. After crossing the creek a few times, and scrambling around on wet rocks, you finally reach the falls. 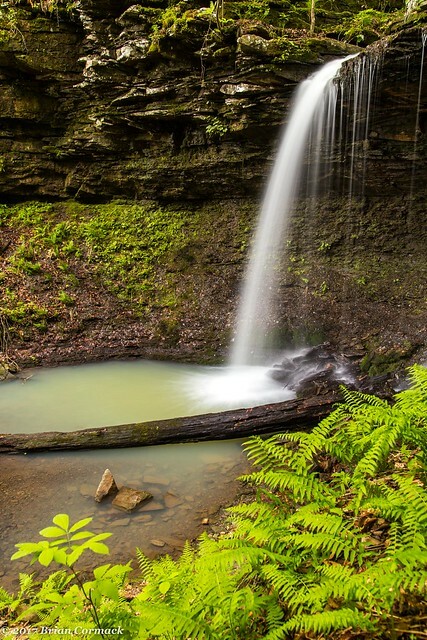 Pack Rat Falls rushes over the bluff and falls 24 feet into a pool that is surrounded by moss and ferns. The large tree that sits in the water below the falls looks about the same as it did when I last visited these falls in 2009. In fact, being mostly submerged in water has apparently helped preserve the log. It's actually been sitting there for a long time, there are pictures of it sitting in the same spot that were taken thirty years ago. After that I hiked back to the campground and made a quick visit to Haw Creek Falls - those pictures coming soon! While I was in downtown Little Rock last weekend, I had time to try to take a few pictures. It was right around sunset, and I stopped by a few spots along Markham Street. The first was the Old State House, which was built between 1833 and 1842 and is the oldest surviving state capitol building west of the Mississippi. It was replaced by the current state capitol building in 1912, and in the years since served as a medical school and as a museum. The building has seen its fair share of excitement over the years. In 1837, when the state of Arkansas was just one year old, the Speaker of the House of Representatives killed a state representative in a knife fight on the house floor. In less extreme news, the Old State House served as the backdrop when Bill Clinton announced he was running for President, and then was the site of his election night victory parties in 1992 and 1996. Just down Markham Street is the Pulaski County Courthouse. Unfortunately, I’ve had to make too many visits here in the past year or so while waiting for a case to make its way through the system. But it is an impressive building. 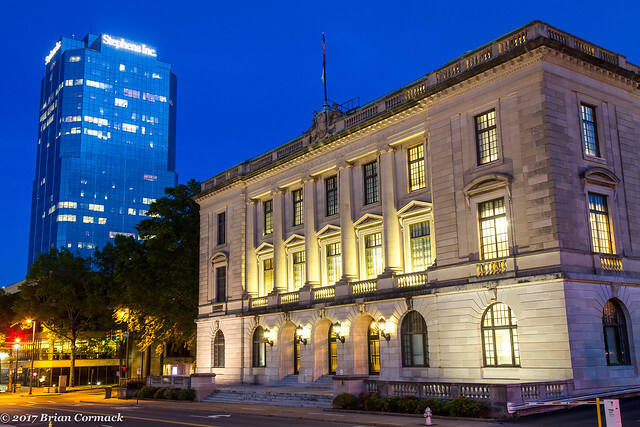 It was built in 1914 by the same architect that designed the current state capitol building. 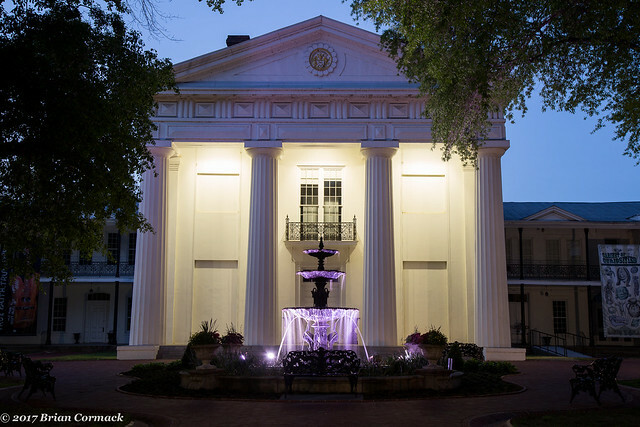 The four story limestone building was designed in the Beaux Arts-style, and has Classical features like tall Ionic columns and Roman arches. The interior features a large stained glass dome, and below a rotunda with twelve statues that represent art, agriculture, machinery and justice. Across the street is the Robinson Center Music Hall, the municipal auditorium that was built in 1939 by the Public Works Administration. The building is named after Joe T. Robinson, who served as a U.S. Senator and who also ran for Vice President in 1928 (he ran with Al Smith, the governor of New York. They lost to Herbert Hoover). Since it opened, Robinson Center has hosted all sorts of concerts and plays, including performances from Elvis Presley, Louis Armstrong and Ella Fitzgerald (I think my first concert there was Third Eye Blind in 1997). 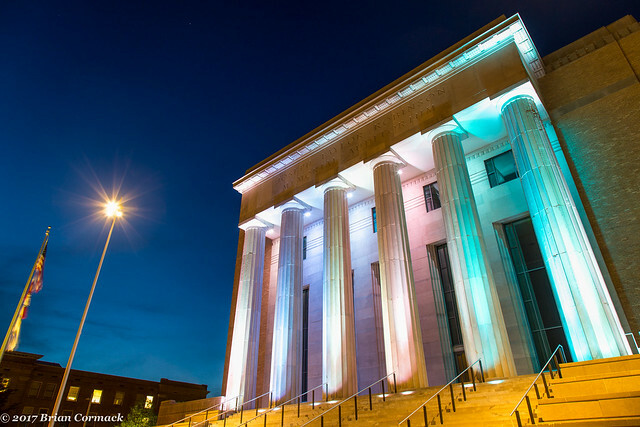 The building just recently reopened after a massive $70.5 million renovation. Caroline needed to travel to Nashville earlier this month, so I took a few days off so that Jonah and I could tag along. So while she was busy with work, I had the day free to see some sights in Tennessee with the baby. 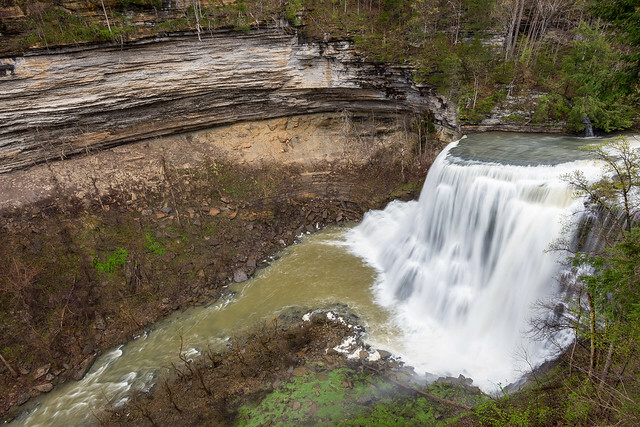 I decided to make another attempt at taking pictures at Burgess Falls, the impressive 136-foot waterfall that is an hour or so away from Nashville. I've made a few trips here in the past, but haven't ever been able to get a good picture. The first few times the sun was out and the light was too harsh for pictures. I tried again last year, but the trail was closed due to flood damage. But this time, things were looking promising. It was predicted to be cloudy and rainy all day, and most of the trail had reopened. So we got back in the car and made the drive east, eventually arriving at the park. I loaded up Jonah in the stroller and started walking towards the overlook to the waterfall. In hindsight, it probably wasn't my brightest moment in parenting. It was a chilly and rainy, and holding an umbrella while pushing the stroller uphill in the mud wasn't all that easy. And while I went on a fairly easy trail, it clearly wasn't designed with strollers in mind. By the time we arrived at the overlook, I hurried to get a few pictures while an unhappy baby let me know that he wasn't too pleased with the trip and with our being out in the rain. But I did at least get the picture, and Jonah fell asleep in the car on the way back to Nashville. After leaving Sally Ann Hollow, we decided to try to hit one more spot before heading home. 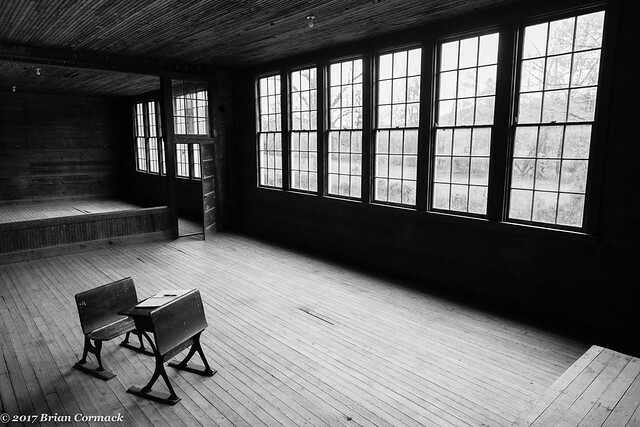 The old Union School sits in the Ozark National Forest, but not many people visit it. It's actually pretty difficult to find the school, since you have to ford the Little Piney Creek to get there. The creek was actually pretty high when we crossed it, and I was glad we were in Matt's Xterra. My poor car would have probably been washed downstream if we tried to cross in it. The Union School was built in 1929. It replaced the first Union School, which was built in 1886 but burned down in 1928. 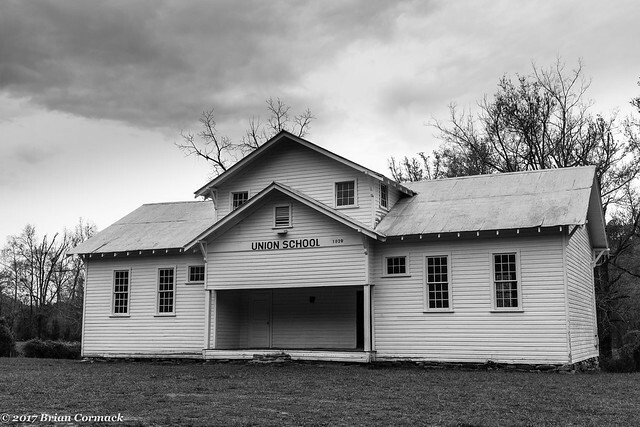 The current Union School is a "1-1/2 story wood frame structure, with a gabled roof, weatherboard siding, and a stone foundation." It's in amazing shape considering its age. And one last shot of the interior of the school. The school was added to the National Register of Historic Places, and was also used as a church, Masonic lodge and a community center. 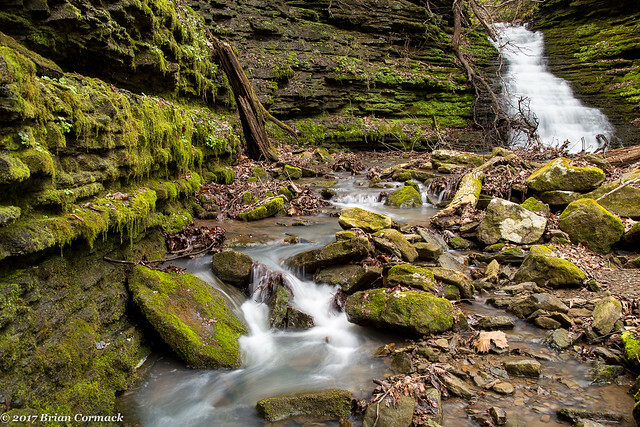 The other weekend, I met up with Matt Kennedy and checked out a promising looking area in the Ozarks, with the hopes that we would find some neat waterfalls. So we met in Conway on Sunday morning and drove up to the hills, heading towards Sally Ann Hollow. 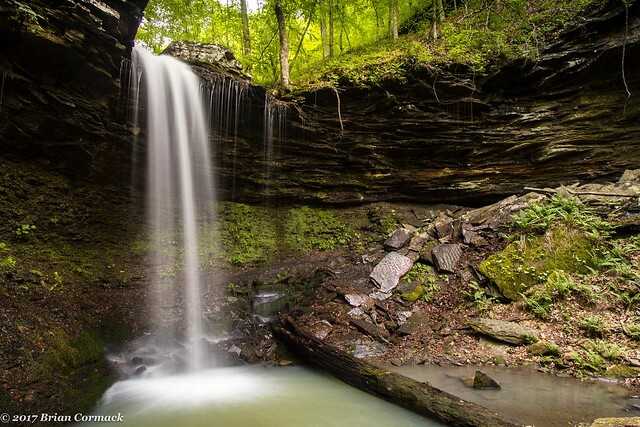 This hollow is a scenic but rarely visited area that is just filled with waterfalls. The hollow is in the Ozark National Forest (in Johnson County), and we arrived to see some bright clear skies and the sun shining down. Which makes for pleasant hiking but not the best conditions for waterfall photography. Clouds and storms were predicted to move in later on that afternoon, so we started the hike into the hollow. 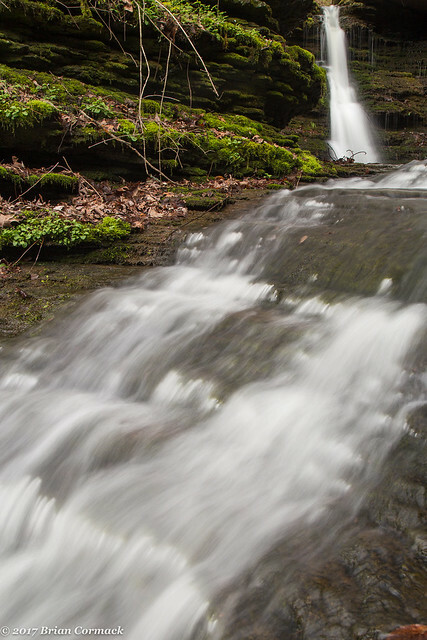 I was happy to see there was plenty of water in the creek, and we passed by several small waterfalls. Since the sun was out, we didn't stop to get any pictures yet. After some walking we eventually reached a waterfall that is about ten feet tall. When we went to get a closer look, some clouds moved through and I hurried to get a quick picture. After just a few minutes the clouds moved on and the sun came back out. I don't think very many people have been back in this hollow, but unfortunately we still saw some faded beer cans sitting on the ground. Probably the main reason why this area isn't visited more often is that there are tons of downed trees in the hollow. It actually looks like a tornado may have passed through here. At one point the entire hollow was covered with fallen trees, which blocked our way like a barricade. After scrambling up the steep hillside we finally made it through, and were treated to some more waterfalls. Luckily the sky had finally clouded up and we started taking a bunch of pictures. This waterfall dropped down through three different levels, and this is the top and middle tier of the falls. All together the falls were probably about 20-30 feet tall. 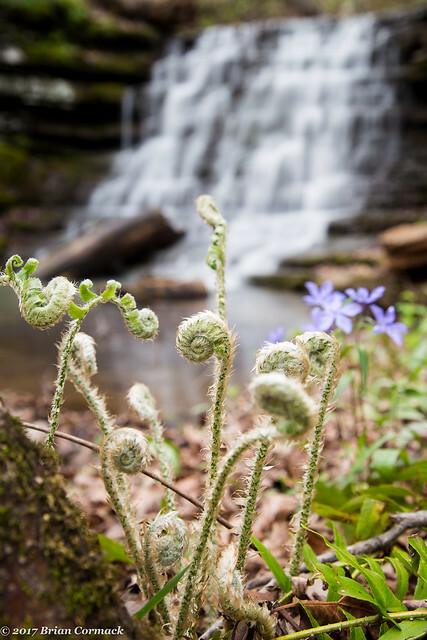 Along the creek there were numerous wildflowers and ferns growing. 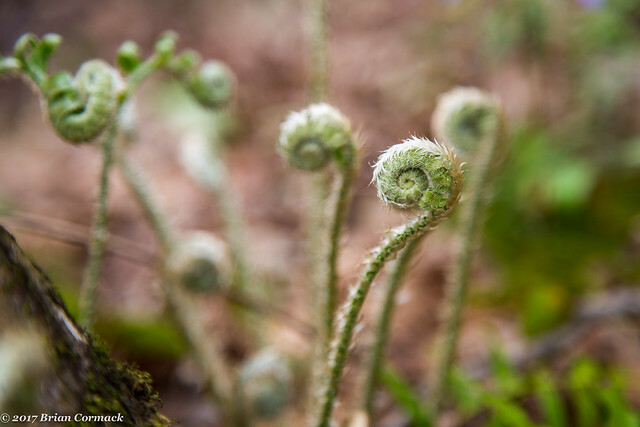 This patch of fiddlehead ferns were growing right by the creek, just below the top level of the waterfall. 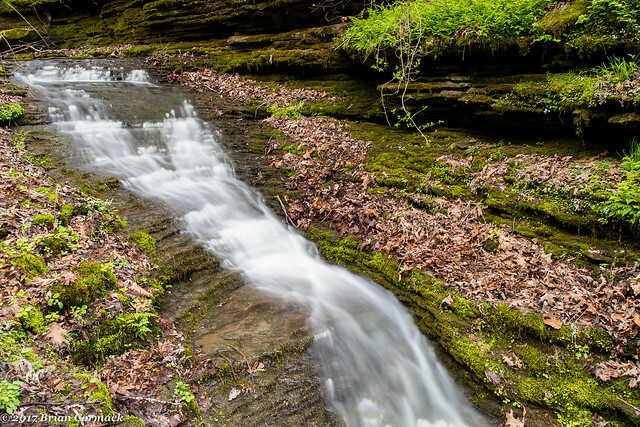 There were some really neat waterfalls in the hollow, including this waterfall where the creek drops about 15 feet and then cascades down the steep hill for maybe 70 feet or more. It was hard to find a good angle that managed to capture how scenic the falls were. The cascade ends here, in a small grotto where the walls are covered in thick moss. We had started to run out of time, so we started to head back to the car. 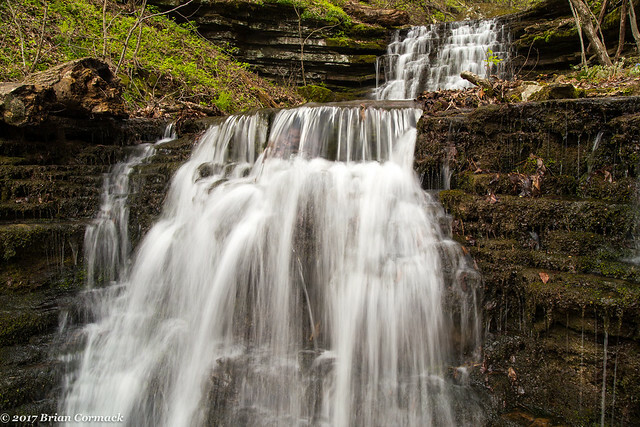 Along the way, I stopped at a few small waterfalls that we passed by earlier when the light was too harsh for pictures. There are more waterfalls in this hollow that we missed on this trip, so it definitely needs a return visit. Hopefully that will come soon! 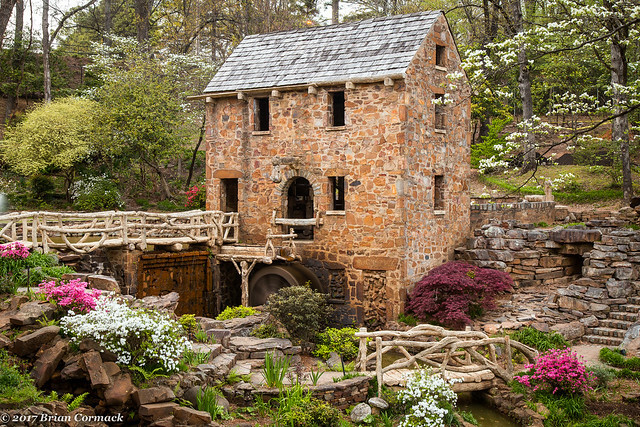 Last weekend I made the obligatory visit to the Old Mill in North Little Rock. It's a popular spot, and is probably even a cliche place to take pictures now. But I grew up in North Little Rock (in fact my grandparents used to live just a few blocks away from the Mill), and I'm fond of the place. The park around the Mill always looks great in the Spring, and I was eager to go check it out again. 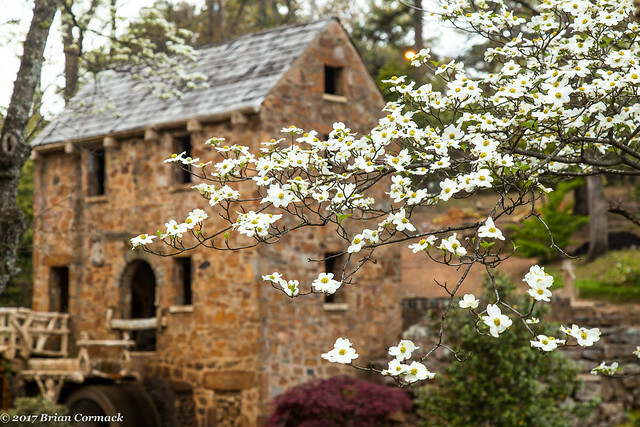 The azaleas were blooming, along with the dogwood trees. Of course, the Mill was absolutely packed with people. I think the vast majority of people were getting portraits taken (with at least two engagement photo sessions going on). It took awhile, but I did manage to finally get a shot of the Mill without any people wandering through the frame.